learn how to grow and care for Aloe vera plants. Follow the step-by-step guide on growing Aloe Vera in pots in doors or outdoors. Aloe vera (Aloe barbadensis) is a medicinally useful succulent plant which has been grown for thousands of years. The gel inside the leaf of this plant is used for treating burns, sunburns, rashes, itching and insect bites. The gel is also used for making the skin soothing and smooth and in many beauty products. However, the scientific evidence for its cosmetic effectiveness is limited. Aloe vera is a member of the lily family. Common names of Aloe species are Indian Aloe, True Aloe, Chinese Aloe, Barbados Aloe, Burn Aloe and First Aid Plant. In India it is known as Ghikwar in Hindi and Korphad in Marathi. Following the step-by-step guide on growing Aloe Vera with information on its care. You can grow your own aloe Vera plant easily, even in pot indoors or outdoors. Position: Where to plant Aloe Vera? Where should you plant an aloe Vera plant, in shade, sun, outdoors or indoors? 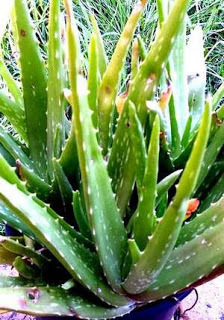 As Aloe Vera is a semi-tropical plant it needs lots of sun light and temperature around 20-25°C (70 -80°F), but will not tolerate cold temperatures. The aloe plant can tolerate full sun for longer period of time but I have observed leaf curling and browning in my aloe plants when placed in full sun in summers in Sydney. I have placed my pots outdoor where they receive direct sun for 3-4 hours in the morning and they are doing very well. During winter, the plant becomes dormant. It may be shifted to indoors during frost and snow. In USA it grows well outdoors only in USDA Zones 9 and 10, and indoors in other zones as a house plant. When growing indoors in pots, they should be placed in south or west facing sunny windows. Often there is a confusion for the type of best soil for Aloe vera. Aloe vera plants grow well in sandy loose soil of pH between 6 - 8 as do all the cacti and succulents. Mix river sand and small size pebbles in the soil to make it loose and free draining (garden soil). You can buy a special cacti soil from a garden shop. You can make your own soil, by mixing compost (make your own compost), sand and sphagnum moss or coco coir in 1:2:1 ratio. Aloe Vera can be grown from seed, but it takes a long time to germinate under greenhouse conditions and the success rate can be very low for home gardener, if you try at home. If you have bought a small plant from the nursery, then repot it in a new pot. The pot should have holes at the bottom to provide drainage. Do not choose a very large pot as aloe Vera prefers a crowded root system. Generally aloe is propagated from existing plants with high success. Propagate aloe Vera from offshoots or baby aloe or pups developed at side of mother plant. When the offshoot begins to form leaves, it is ready to transplant. Carefully separate the baby aloe from the mother plant, allow to dry its wounded area. (Optionsal) Dip the cut end of the offshoot in rooting hormone powder and plant in a pot. The rooting hormone will accelerate the root growth, but it not essential. Water the plant to make the soil moist. Insert the dried end of the cutting in soil to at least 1 inch inside. Moist the soil slightly. The palnt should be mulched like stones or pebbles. Do not mulch with organic mulches which keep the soil moist all the time. How often should you water your aloe plant? As Aloe Vera is a succulent plant so it is happy in dry and hot conditions. It does not need much water. Water only when the soil of the plant goes completely dry. Water the potted plants only little to make the soil moist. The plant stores water in its spongy leaves. Hence, the water requirement of this plant is very less. Over watering or watering too often will cause leaf rot, the plant may die. Water the plant, only when the soil is dry. During winter, water only once a month. Aloe Vera plant does not need much fertilizer. You can fertilize with a small amount of diluted phosphorus rich liquid fertilizer in spring. Over-fertilization cac harm the plant. Aloe Vera is generally resistant to pests and diseases. Kemper Center for Home Gardening: Aloe vera", Missouri Botanic Gardens, USA.